The word “supergroup” is tossed around a lot in instrumental music circles, the result of a seemingly endless supply of efforts to package together individual virtuoso players and make a band out of them. But every once in a while, the group part of that shopworn term becomes authentic and real. Such is the case with The Aristocrats – British guitarist Guthrie Govan (Steven Wilson, Asia), American bassist Bryan Beller (Steve Vai, Dethklok) and German drummer Marco Minnemann (Steven Wilson, Adrian Belew, Necrophagist) – who defiantly and joyously blow the supergroup stereotype to bits, thrilling audiences and fans around the world in the process. Japan’s Admiral Yamamoto is famously quoted to have said, “I fear all we have done is to awaken a sleeping giant.” Surely this thought runs deep in fans of The Aristocrats’ smash debut album. The band found recording works best when you can look your bandmates in the eye while thrashing out new tunes. 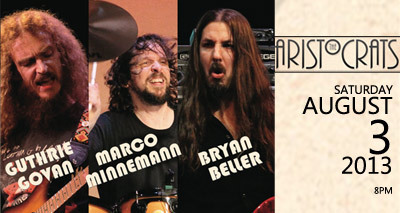 Govan, Beller, and Minnemann did exactly that when each brought three even heavier and more adventurous songs to a Nashville studio last January, resulting in a new album appropriately titled Culture Clash considering their multi-national backgrounds. The new disc is due to drop in July. This summer the world will learn Yamamoto was right.